Sometimes people ask me “Where did you get your training to be a Psychologist?” Sounds like an easy question, but the answer is probably a little more complicated. I would estimate that about one third of my training has been though formal education, one third through life experience, and the other third?…..well, from all of the courageous clients that I have treated over the past 25 years. The latter, in all honesty, probably has been the most useful. Over the years my clients have educated me about what approaches have been helpful to them, and which strategies and interventions have been less useful. Additionally, there is hardly a week that goes by that one of my clients doesn’t bring in some article that he or she has read or some piece of information pertinent to counseling or self-improvement. Just recently one of my clients brought in an article about “Cumulative Stress Disorder”. Now even though this is not a “formal diagnosis” that we use in the field, it reminded me of one of the most common issues that I see clients presenting with in my office. It’s what I call the “saturated sponge effect”. WOW! No wonder he is depressed. I would be more surprised if he wasn’t depressed! The reason he is depressed is so clear to me. And for those of you reading this blog, I’m sure it seems obvious to you as well. But interestingly enough, most people in this situation express genuine bewilderment about being depressed. They feel guilty that they aren’t able to handle the stress. They feel inadequate. Sometimes ashamed and embarrassed that they are seeking help. They feel like something is wrong with them, because they are not able to handle the daily stresses of life. This is so, so far from the truth! In my opinion, these individuals are responding just the way they are supposed to, just the way they were created to react. This is just how we are wired. We are built to withstand only a certain amount of stress and pressure, and when it gets to be too much…well we shut down, get depressed, become anxious and begin to have trouble functioning like our normal selves. In some ways we are much like a sponge. 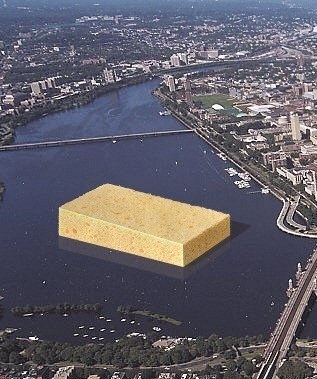 A sponge is made to be able to soak up only a limited amount of liquid. If I spill a little water on my desk, a hand sponge can soak that right up. Even if I spill a whole glass of water on a ceramic floor, with that same sponge I can soak up all of that water and have a nice dry floor. But if someone comes in and throws several buckets of water on the floor….now my sponge’s capacity to absorb is overwhelmed and it becomes ineffective. The same is true of our psyche. We are made to only be able to withstand so much stress and pressure. When we are flooded with one trauma after another, even if it appears to be over an extended period of time, eventually we become overly saturated. Our capacity to cope is overwhelmed and we get depressed. Has this ever happened to you? Have you ever had one stressful thing happen right after another to the point where you feel like you just can’t handle one more life stressor? Well you are not alone. This has happened to most of us at some point in our life. And it is likely to occur again. And when it does, it is important to go easy on ourselves and understand that we are responding just the way we are supposed to. But more importantly, it is imperative that we not just sit back and be paralyzed by a sense of helplessness and defeat. This is the time to reach out and seek help. A good therapist can help normalize what is happening to you and assist you with developing and implementing a concrete plan to cope with the stress and eventually overcome it. Part of the strategy will be to talk through all that has happened to you and come up with a strategy to wring out the sponge so that you can, little by little, get back to you old self again. If you are oversaturated, don’t hesitate another moment. Reach out, wring out, and get your life back.